Fish it slowly like a conventional worm, or fast like a spinnerbait. 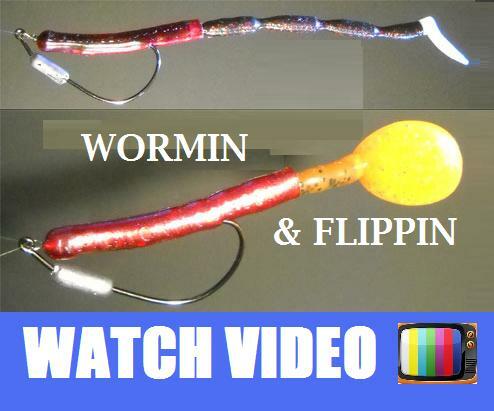 Feel it thump on your line like no other worm. 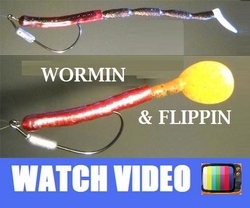 The worm telegraphs exactly what it’s doing right back to you, and lets the fish know it’s there as well. Let it be your edge over the competition. The entire worm also shakes side-to-side – front to rear. Look at the underwater videos. Does your worm do this? Insert rattles and…wow! Flippin’ is one of the most-productive techniques there is, and flippin’ a RotoTail means unprecedented tail action. Hang on! You can also buzz the RotoTail just under the surface, across lily pads and let it flutter into holes, or right across the top of the water. Watch the RotoTail create vibration and flash unlike any other plastic bait. Fish it fast unlike any other worm. Make the RotoTail call fish from unprecedented distances even in roiled up or muddy water. Feel the thump, thump on your line and hang on!